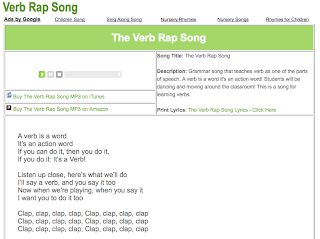 The Verb Rap Song is quickly becoming a classroom favorite for teaching verbs. This Verb Song takes on the idea of the Cha Cha Slide and will have your kids singing, dancing, and learning..."A Verb is a word it's an action word..."
You can also find: The Simile Song and the Subject and Predicate Song for teaching language arts. Awesome! Sad there wasn't an appearance by Fizzle-D, though.